The necessity of continuing to work while pursuing an MBA is a reality for many students. Part-time programs, built to fit into work and family schedules, are an increasingly sought after format for the MBA. The DMV metro area is home to some of the top part-time MBAs in the country. Here is a look at five of the best Washington DC part-time MBA programs. Virginia Tech’s Pamplin School of Business’ evening part-time program recently jumped three places to 14th in U.S. News and World Report‘s rankings. Also ranked as the top public university part-time degree, the evening program at Pamplin begins in spring or fall, and can take anywhere from two-to-five years to complete, with the average student receiving an MBA in 3.5 years. 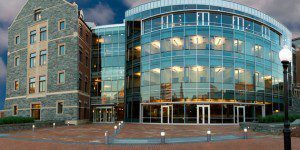 Johns Hopkins’ Carey School of Business’ Flexible MBA also has the success of the working student at its forefront. With a degree “proven to get six-figure results” Carey’s flex MBA is online, in-person, or in a blended format. The program’s average length is 2.7 years and is comprised of 54 credits. With concentrations in Healthcare Management, Leading Organizations, and Marketing, the online courses are offered in eight-week terms. The in person delivery method, also comprised of eight-week terms, offers the additional concentrations of entrepreneurship, financial businesses, interdisciplinary business, and real estate and infrastructure. While graduates of the Carey Flex MBA program succeed in a wide variety of industries, recent data shows that 67 percent of students landed in consulting positions, and 33 percent took roles in healthcare. With several different options available—24 months, 28 months, or a flexible, self-paced duration—Smith’s degree meets the professional in the middle between their education and career. Smith offers frequent info sessions, both in person and online, for those who wish to learn more about the flex programs in person. Classes are offered throughout the year in four terms. Loyola University’s Sellinger School of Business also ranked among U.S. News and World Report’s top part-time MBA programs. Sellinger Professional MBAs may complete the program’s 33-42 credits at a self created pace, in as many as six years or as few as two and a half. Encouraging “students to align personal interests and career goals” with the curriculum, Sellinger has a wide variety of specializations from which to choose; professional MBAs can major in data analytics, finance, accounting, and marketing to name just a few. Kogod School of Business at American University offers its top-ranked part-time online degree in a 24-month course sequence (completed by most students), but it can also be completed on a 12-month, 15-month, or 18-month track. Comprised of 48 credits, there are 12 core courses, three electives, and two in-person immersions. The Kogod MBA is pointed squarely at helping businesses to grow, as stated on the program’s site. “The online MBA program prepares students to apply leadership and financial analysis skills to help businesses operate more effectively”. Students can choose from six concentrations or can customize their degree to their specific career goals. Concentrations include Business Analytics, Finance, International Business, Cybersecurity and Marketing.